Have just refuelled and restored in Cooktown overnight and am now 9 days into a 14 day liveaboard charter with Martin Hirsch. 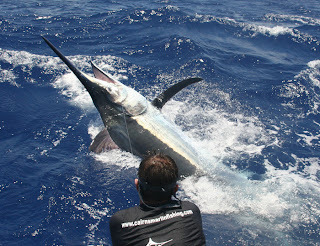 We’re currently experiencing fantastic fishing and have caught 17 marlin in total over the 8 days to date with several bites a day. Have caught 3 in 1 day x twice and 4 in 1 day being a highlight. 1 x 950lbs (est), 2 x 800lbs (est) and other good mid range fish. Yesterday we saw 1 of the largest marlin I’ve ever seen fishing on the reef and she came up as we had a double header on (200lb & 600lb fish) with plenty of action and ate a loose bait……back out to look for her today!!! Conditions are alot calmer with 10-15 knots and with the full moon upon us, expecting less bites though anticipating bigger fish amongst them. Continuing to fish the middle of the Ribbon Reefs, looking to head a little further North.